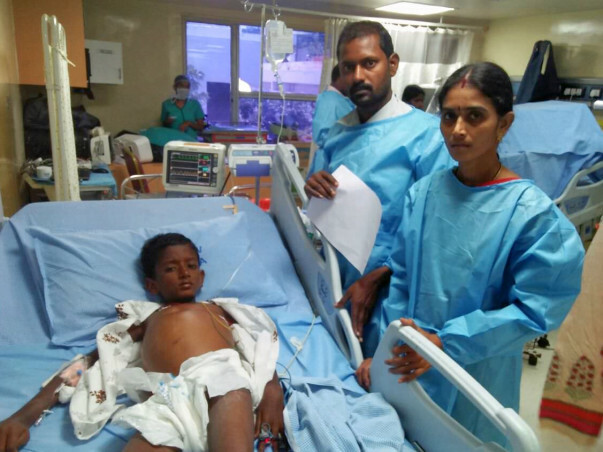 A few days back 10-year-old Bhanu Venkata was diagnosed with Wilson's Disease. Wilson's disease is a genetic disorder in which copper builds up in the body. Symptoms are typically related to the brain and liver and include vomiting, weakness, fluid build up in the abdomen, swelling of the legs, yellowish skin, and itchiness. Bhanu's condition is quite critical. His stomach has completely swollen up and his eyes have turned yellow as well. 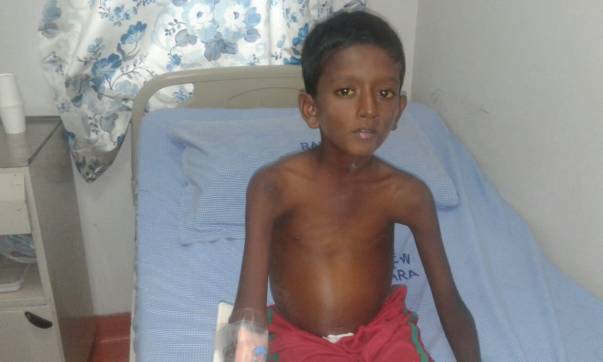 Bhanu has become very weak and urgently needs treatment. 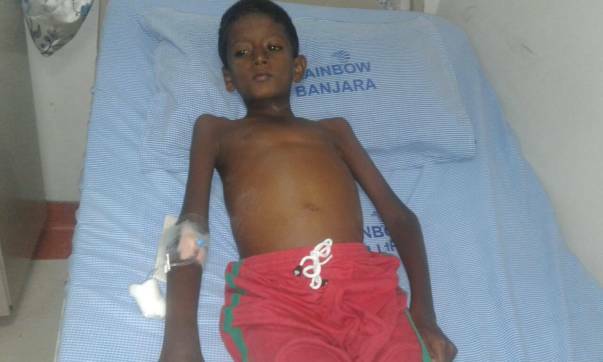 Given that Bhanu's condition is so severe, he has been advised to immediately undergo a Liver transplant. The cost of liver transplant amounts to approximately 16 lakh INR. 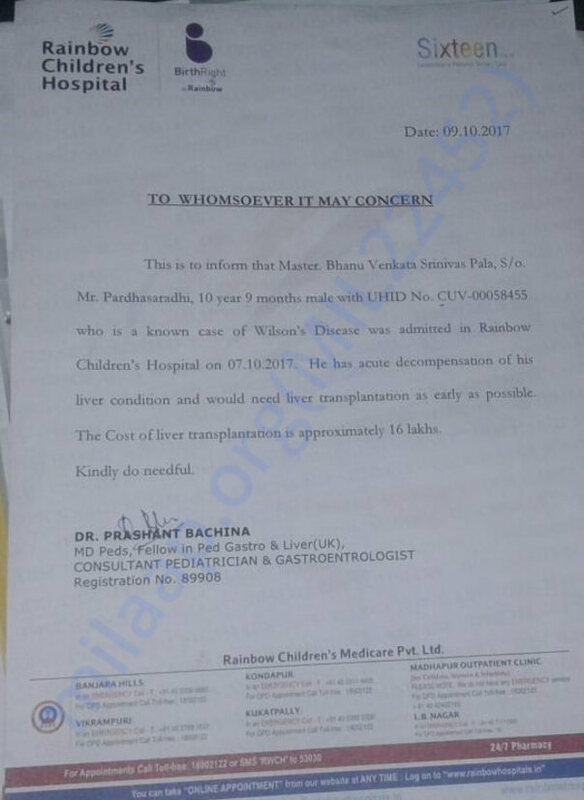 Unfortunately, Bhanu's family do not have the funds required to pay for his transplant as his father only earns 18000 Rs. a month. They are willing to do whatever it takes and need our help. Unlike most children his age, Bhanu is not scared of injections and has never cried at all the invasive tests. He just wants to get better and go home. Pardhasaradhi is over 3 lakhs in debt and he needs to arrange 16 lakhs more to make that happen. It is an amount far beyond his means and there is no way he will be able to arrange it in time. Contribute to help this desperate farmer save his son. Bhanu passed away yesterday (22nd Oct). 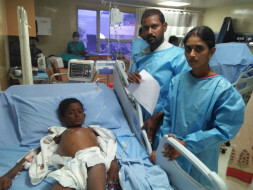 Our hearts go out to this brave child who endured so much pain and fought so hard for his life but due to the severity of his condition he was unable to make it. Your timely support ensured that he received the best medical care. Funds from the campaign will be utilized for bills incurred by the family for Bhanu's treatment so far. We will post another update soon with more details on the family. For now we would like to thank you for all your love and support towards Bhanu. The family is grateful for all the care and support you’ve shown Bhanu. We hope they find strength in this time of grief. May Bhanu's soul find peace. Please keep the family in your prayers.